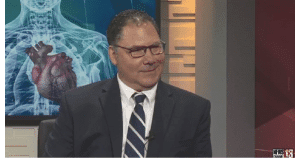 Dr. Frank Dimase, chief of emergency medicine at St. Peter’s Hospital, was one of the first guests on Benita Zahn’s new, online health program, ‘Health Beat.’ The program features five-minute interviews with leading health experts in the Capital Region. In this segment, Dr. Dimase discusses summer hazards and how to avoid a trip to the ER. To watch Dr. Dimase’s interview, click HERE.